The McDavid Groin Strap features a contoured, low profile neoprene strap with 2-way stretch and Velcro® closures for optimum fit and adjustability. Adds warmth and compression to upper thigh and hamstrings. 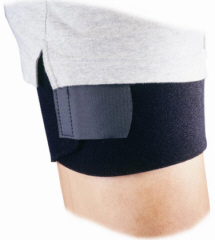 Closed cell neoprene retains body heat and promotes healing. Contoured for comfort. Universal sizing.